How far we've come since the cold days of last winter when we were all pouring over seed catalogs deciding what we would plant in our gardens this year. We didn't know if we would have enough rain, too much rain, or too little rain. We didn't know if it would be a hot summer, a cool summer, or just average for our areas. We just knew we were planting vegetables, once again or perhaps for the first time. And if we were experienced vegetable gardeners, we knew to expect high points and low points through out the season. Here are some of the low points and high points from my vegetable garden so far this year. Low point: The tomatoes took their time ripening, setting a new record for me for the latest I've harvested the first big red tomato. Fortunately, I was briefly distracted and my wait was tempered by the fact that I did grow the WUT, the World's Ugliest Tomato. High point: Since harvesting the first tomato, I have been picking a lot of tomatoes of all sizes and now have a couple dozen big tomatoes sitting on a tray on the kitchen table, surrounded by dozens and dozens of cherry and currant type tomatoes. Low point: The raccoons, who have never to my knowledge bothered my garden before, discovered my sweet corn one night. They helped themselve to nearly all of it, the dirty thieves. High point: I at least got a few ears of homegrown sweet corn before the raccoons arrived, and that corn was delicious. No butter needed. I repeat, no butter needed, they were that good and sweet. Low point: The squash vine borers seemed to come out of nowhere and before I could say "Who wants some zucchini? ", all the vines were dying. High point: I had enough zucchini to eat some and share some. It was actually kind of nice not to be overrun with it. Really, it was. At least I'm telling myself it was. Low point: The eggplant plants never did get very big or leafy. I think it was just too cool for them most of the summer, and then suddenly it was hot and dry. High point: I did manage to harvest one eggplant today. See it in the lower left corner of my trug? Tomorrow, I'm going to peel it, slice, coat it with flour (or cracker crumbs) and fry it up. Because, other than the big ripe tomatoes, fried eggplant is my favorite vegetable from the garden. Any other eggplant lovers around? Overall highest point: I had a vegetable garden. There will always by low points in any garden, but hopefully there will be more high points, just like a good roller coaster ride. So no matter what, I'll always have a vegetable garden. What kind of roller coaster ride did your vegetable garden take you on this year? I'm an eggplant lover too! We had one from the garden tonight, sauteed with garden onions, green beans and corn. The corn was the only ear with kernels...about two tablespoons worth and the green beans were the 10 I picked when I pulled the plants today. They never did well this year. On the other hand we've had lots of cukes, peppers, eggplant and a couple hundred tomatoes...so far! Loved the highs and lows, Carol. Your basket is full of beautiful produce that I know you and your family will savor. 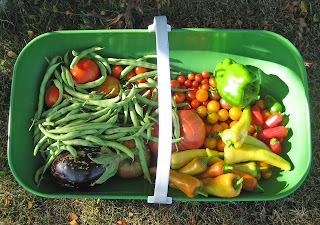 My garden had wonderful green beans, green onions, radishes, swiss chard, peppers, basil, cucumbers, and malabar spinach. It also had and has not so great tomatoes and strawberries. The tomatoes were severely hurt by our 45+ days of over 100 degrees, which started so early that most of our blooms didn't set at all. I'm hoping for a better Fall crop that I am nursing right now. Great post! High point, I have had a gret time growing my first pumpkin even though I did not mean to. Low point, I have only had a few yellow pear tomatoes because I put them in too late and the heat kept them from setting fruit. Well, we're only just starting our summer plantings here, but I can tell you that my broad beans are yet to pod -- lots of flowers, though -- the bok choy, leeks and lettuces are good, and I have teeny-weeny Brussels sprouts appearing because winter has been long and cool here. On the down side, not a single pea of any variety has come up! Oh well - you did better than I did on the balcony. My vegetable gardening was great fun, but a bit of a disaster from the results point of view. A lovely harvest post. There are always highs and lows in any gardening year, aren't there? I think we've had some WUTs too - marmandes grow like this. I think sometimes the uglier, the tastier, though. I love eggplants too - we call them aubergines here in France - and they're best fried or grilled. We eat the skins too. Bon appetit! Low Point: The weather. Until a couple of weeks ago we had constant rain all summer long. Way too much rain. Then it stopped and we haven't had any since. High Point: The massive quantities of tasty spring and early summer lettuce. Low Point: Having a squash vine borer get under my row cover on my pumpkin. Though I did kill them and try to patch the stem back up. High point: Finding a pumpkin starting to set right when I was going to give up and pull the plant. Hopefully it will have time to ripen. This post was a good read! I don't grow vegetables but there were highs and lows here in my garden. But I didn't have to contend with rascally raccoons stealing my corn. Sweet corn without butter, yummy! I didn't know about eggplant until college! Now it is a staple in my diet! Carol, this was a nice read and recap of your garden's summer. But, perhaps a bit premature? I'm only a bit of 100 miles from you, and I only just harvested my first ripe tomato thursday - yeah, that's right, August 28! And it was a cherry tomato. I have yet to harvest my first large-sized tomato, but am getting about 15 cherry tomatoes when I harvest tomorrow morning, and have about 40 large romas and about 10 brandywines that are quite large, but not even starting to change color yet. That's my low. My high? While several neighbors have already harvested lots of tomatoes, the facts that we haven't had any rain in over 6 weeks, and that they all have had pretty serious bouts of verticilium wilt have conspired to kill the tomato plants of every gardener I know within my general area. But, since I used raised beds, planted in beds that have never housed tomatoes, and set up automatic irrigation, my plants are quite healthy. It's just my persistent shade that keeps my garden always a bit behind others that has me waiting. Another high? My first year strawberry harvest, out of 13 square feet of strawberries? 15 quarts. The associated low? That's what I payed my pet and garden sitter while I was away for 4 weeks in June and July. Another high? Borage, parsley, oregano, sage, nasturtium, and most especially, basil, are all growing completely uncontrollably. The low? Dill has done pathetically for me, and cilantro flowered while I was gone, causing it to taste like cardboard. I had used all my cilantro seeds, and couldn't find any more, so when tomatoes finally are ready - no cilantro for the salsa. But, mostly, my garden is just now reaching the high point of its yield of summer crops, and the summer-sowings of green onions and carrots are doing quite well. It's also getting close to time to sow spinach again. Plus, in a rare event (ok, first time ever), I've already started soil prep for next spring's new project. So, rather than panickingly digging in mud in the spring, I'll be able to plant the new permanent herb garden that will border the veggie garden. Like you, the squash beetles got to my squash plant before I knew it. The good part was that we did get several squash before that; after all, how much yellow squash can one eat? The low point this year has to be my tomatoes. As I've mentioned before, the blight got to them before I realized it, and all the plants are dying. We did pick a lot of tomatoes, though, and there are still red ones ripening on the dying vines, so they weren't a total loss. I planted a japanese eggplant this year. I'm not sure why, I've never grown any before. It produced very well, but most of them ended up in the compost pile because I wasn't sure what to do with them, and took too long to figure it out. Sigh. My husband thinks I'm crazy. I also planted radishes and I don't like radishes. But they were fun to grow! Guess I'm just a garden geek.